This is a unique body soap with grains, a fine natural base is prepared with extracts of orange and it peel which are skillfully added. 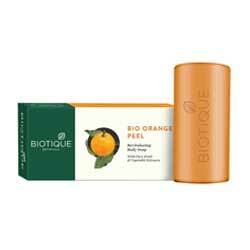 The enzymes contained in the Orange peel remove dead epithelial cells and deep cleanse the skin. The rubbing action helps speed up natural cell renewal leaving the skin fresher and younger looking. Regular use makes the body free from skin problems like ringworm, scabies and dermatitis infection. It leaves skin clean and healthy looking. It is hypo-allergenic and clinically tested. Apply appropriate amount to the skin. Massage gently. Extracts of Orange and its Peel.